Summer is here and there’s no better time to get grilling! We’re sharing some of our favorite grilled dishes YOU can make with ease. Cook’s Note: A direct method to grill the salmon may be used. Soak the cedar plank well. Spread the mustard and brown sugar on the salmon, but do not place the fish on the plank. Set up the grill for direct grilling on medium-high. 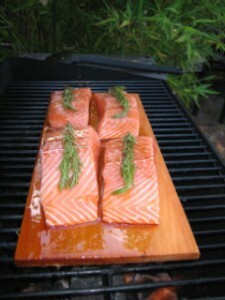 When ready to cook, place the plank on the hot grate and leave it until there is a smell of smoke, about 3 to 4 minutes. Turn the plank over and place the fish on top. Cover the grill and cook until the fish is cooked through, reaching an internal temperature of 135 degrees F. Check the plank occasionally. If the edges start to catch fire, mist with water, or move the plank to a cooler part of the grill. Remove Beef from package, rinse, then place in a 13’x9” glass pan. Mix vinegar, olive oil, garlic, onion, pepper and oregano in a separate bowl. Spread mixture on beef. Cover. Marinate overnight. Coat grill pan with vegetable oil. Heat pan until hot. Place beef into the pan. Cook for 20-30 minutes, turning beef to cook all sides. 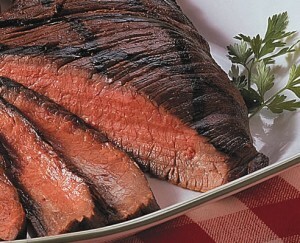 For food safety purposes, internal beef temperature will register at 145 degrees. Yield approximately, (4) 3 oz servings. Wash and dry vegetables. Cut vegetables on the diagonal. Mix olive oil, garlic, onion, and pepper in a small bowl. Brush ingredients onto vegetables. Heat pan until hot. Place vegetables into the pan, rotating a few times. Cooking time varies with personal preferences. Yields approximately (4) 1c servings. all grill recipes look delicious! 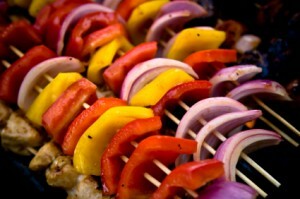 Look at the shades of summer with the grilled vegs.